Combine sliced peaches, sliced pears, apricots, pineapple and more for a sweet, fruity dish. Drain fruit and place in a 9- x 13-inch baking dish. Melt butter and mix in brown sugar and curry. 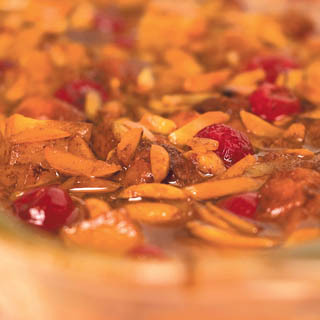 Add curry mixture to baking dish, and sprinkle almonds on top. Bake for 1 hour.